Unlicensed informal hawalas (money changers) still operated illegally in parts of Pakistan. The informal and secretive nature of the unlicensed hawalas made it difficult for regulators to effectively combat their operations. Most illicit funds were moved through unlicensed operators, including through bulk cash smuggling. Syria’s financial sector remains vulnerable to terrorist financing. An estimated 70 percent of all business transactions are conducted in cash and as many as 80 percent of all Syrians do not use formal banking services. Despite Syrian legislation requiring money-changers to be licensed by the end of 2007, many continued to operate illegally in Syria’s vast black market, which is believed to be as large as Syria’s formal economy. Regional “hawala” networks remained intertwined with smuggling and trade-based money laundering – facilitated by corrupt customs and immigration officials – raising significant concerns that the Syrian government and business elites could be complicit in terrorist financing schemes. The report also indicates that additional work needs to be done against hawala and terrorist financing in Saudi Arabia, Gaza and the West Bank, and the United Arab Emirates. While the developers of the Ground Zero Mosque may finagle tax-exempt financing (see Creeping Sharia), a pro-Israel organization is being denied tax-exempt status by the IRS according to a new lawsuit. Check out the coverage on TaxProf Blog: Lawsuit: IRS Using Bob Jones University to Deny Tax-Exempt Status to Pro-Israel Charity. NAIT is the waqf (Islamic endowment) component of the Islamic Society of North America. Remember that ISNA, NAIT, and CAIR were all unindicted co-conspirators of the Holy Land Foundation, the American Islamic charity convicted of funding Hamas. The Zakat Foundation touts itself as a transparent, four-star Islamic charity about whom Charity Navigator stated, “The Zakat Foundation has demonstrated exceptional financial health, outperforming most of its peers in its efforts to manage and grow its finances in the most fiscally responsible way possible.” The Chicago Tribune recommended it as an organization that readers could make donations to for Haiti earthquake relief in January. And Hillary Clinton’s State Department bragged about the Zakat Foundation’s efforts in its servile America.gov coverage of Muslim American charity in Haiti. It’s the kind of organization that you would donate zakat to this Ramadan. An organization that would never sully itself by consorting with nefarious pro-Hamas charities of Yusuf al-Qaradawi’s Union of Good charity network, right? 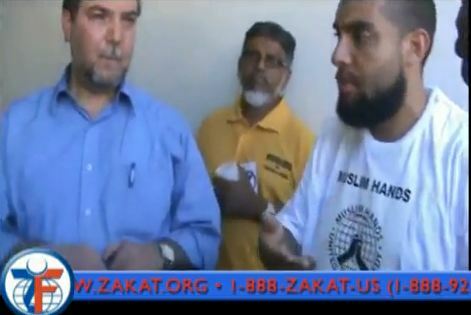 A separate YouTube video confirms the identity of the Muslim Hands official as Abdul Latif (wearing the same t-shirt): Read the rest of this entry ? Take heart, dear reader. You’re not alone in your concerns about the financial jihad against us. You’re not the only one who wants to follow the money behind the Ground Zero Mosque. You’re not the only one who wants to know where Al Qaeda gets its financing. You’re not the only one who recognizes that the Islamists receive most of their funds through taxes mandated by Muhammad, and that Yusuf al-Qaradawi’s “jihad with money” must be resisted at every turn. The jihadist is being unveiled. The word is spreading. We often apply the term “blacklist” to any terrorist designations by the U.S. State Department, Treasury Department, the United Nations, and FATF. But each organization’s blacklisting carries its own specific meaning. The State Department designates foreign terrorist organizations (FTOs) under Section 219 of the Immigration and Nationality Act. Designation serves as a stigma and a sign of American disapproval, and members of designated FTOs are “inadmissible and removable” from the United States. Treasury designates and sanctions countries and individuals under a mix of executive and Congressional authorities, usually within the context of identifying people, companies, or countries that have some role in financing terrorism, not just espousing terrorist views or even engaging in terrorist acts. Treasury designations require American banks to freeze any accounts held by the designee and prevent Americans from doing business with the terrorists. Designations by the United Nations, for example, blacklisting by the UN’s Al-Qaida and Taliban Sanctions Committee, result in asset freezes, bans on international travel, and arms embargos in accordance with Security Council Resolution 1267. FATF identifies countries that are sponsors of or have such weak controls that they are high risks for money laundering. Officially FATF calls them “non-cooperative countries,” but it’s a blacklist. Corporations in FATF member countries should avoid doing business with blacklisted countries or be at risk of indirectly helping those countries launder money for terror. By the way, FATF is based in Paris, and they should probably blacklist France itself for its steadfast business relationships with Iran, itself a blacklisted country. 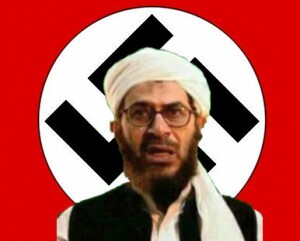 When 9/11 money man Mustafa Abu al-Yazid, a.k.a. Sheik Saeed al Masri, died in May this year, national security analysts speculated on who would succeed him. In 1999, Abu-al-Khayr recruited terrorist Shadi Abdallah who was later put on trial in Germany. At some point Abu-al-Khayr served as a body guard to Bin Laden and married into the Bin Laden family. No press reports at the time this post was prepared indicated which one of Bin Laden’s 25 or 26 children Abu-al-Khayr has married. Bin Laden has four wives, and since his fourth wife is 27 and Abu-al-Khayr is 35, that probably (and hopefully) rules her out as the mother-in-law. Abu-al-Khayr appeared on Saudi Arabia’s 85 “most wanted” list in 2009. As of yesterday, Abu-al-Khayr was designated as a terrorist financier by the U.S. Treasury Department and the United Nations. This means that U.S. and other banks will freeze his assets, that Americans cannot do business with him, that he is banned from travel, and he is subject to an arms embargo from the U.N.
You are currently browsing the Money Jihad blog archives for August, 2010.